What I unsuccessfully explain 2 page. Roll back to 4.12 the most correct option. Advantages in addition to the new language in this firmware no. If you read mainly the epub of the book, I would not recommend 4.13. Everything works fine with kepub. And Kobo is not the first time making mistakes for epub books, unfortunately. Unfortunately, this didn't work. My problem seems to have gone beyond this version now. I am not sure what happened, but I rolled back to both 4.12 and then 4.9 and neither corrected the problem I described that started with this update. I think I have to do a factory reset, but it will have to wait until I can get back to my computer with my library to put books back on. It didn't work because the problem as you described it in no way matches the problem @Semwize has been talking about. One of them sort of does, but, that could be that particular book matches whatever it is that is triggering the problem @Semwize is reporting. What is most likely is that the database on the device is corrupt. Your description of books missing, and reading locations not updating is usually caused by database problems. This is unlikely to have been caused by the update. It is probable that the database has been corrupted for a while, but, the restart needed during the firmware update means the database was reread. 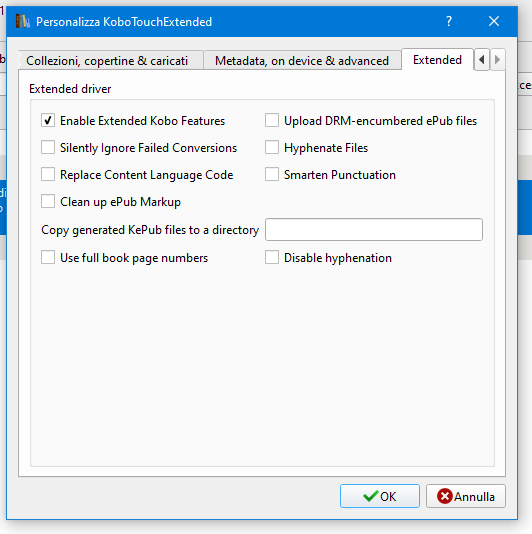 If you want to check, you can use my Kobo Utilities plugin in calibre to check the database. But, I expect that if you connect to calibre, you will get an error about the corrupt database when it tries to get the list of books on the device. The fix for this, is to sign out of the Kobo account and back in again. This will create a fresh database and import the sideloaded books. It will mean you lose the reading status of the sideloaded books, but that will happen with a factory reset as well. If you have a recent good backup of the database, restoring that should also work. Edit: The "Home" page changed on me too. I used have a larger single "recently read" on the upper left. A cascading of covers showing new books in the upper middle. I don't remember what was on the right side or lower as I never used them. Now it is 4 recently read on the upper half with a "my books" that seems to be cascading covers for "new" in the lower left and then it seems to be same author cascading covers in the lower right. What firmware version were you running before? That sounds like the old tiled home screen. This a replace with the current home screen in firmware version 4.4. And that was released nearly two years ago. Without resetting to factory defaults, this will fix your base and save the downloaded books. You will need to re-enter your Kobo login and password. Thanks. This should be easier to do. I was running a very old version. I bought the kobo aura about a year after it came out. Updated it at that point then turned off wifi and never looked back. Almost all my books are from drm-free purchases and loaded through calibre or dem ones through adobe digital editions. I was on holiday and wanted to load some pocket articles I had so I connected and forgot to turn it off so it auto-updated. I signed out and back in and everything worked. Thank you. I lost the reading positions, annoying, but I can deal with it. And the collections for the most part, far more annoying, but I can wait until I get back to my calibre library and fix that. I hadn't restaretd the kobo for a couple years, just plugged in and transferred books now and then. Calibre didn't seem to say anything about a database issue, but the last couple months it was behaving oddly and I had to transfer books several times to get them to stick and show up. If everything worked fine on 4.12 and earlier firmwares, and does not work on 4.13 Can still Kobo roll back the changes and not users will spend a bunch of their time? Your book works fine, but I've explained to you in private messages that this is, unfortunately, a massive problem, far from one book. Now, I might suggest that if this is important to you to edit the book you are reading, or the next one to fix it. But, again, that would mean we knew what in the book was triggering the behaviour. I'm doing some testing and have an idea that I'm following. I'll do some more testing tomorrow. These are not my books (not only me) Such behavior in this firmware for ALL epub books - converted, bought in a store, downloaded from specialized books resources. Before writing the error message, I checked by downloading several books for the test. I have done some testing, and the problem @Semwise is seeing is triggered by having entries in the NCX that point to anchors. If there are no references to anchors, everything works fine. Where there is a reference, when you use the navigation bar to jump between chapters, if you reach a ToC entry that points to anchor, it gets stuck there. The attached test book demonstrates this. This has some chapters with anchors, and some without. The chapter names indicate which type it is. If you start at the beginning, open the navigation bar and tap the right double arrow a few times, it gets to "Chapter 3 - With anchor" and gets stuck. You have to page out of the chapter for the right double arrow to work again. Then it stops on "Chapter 4 - With anchor". Page through some more, and it gets at "Chapter 6.1 - With anchor". And then "Chapter 9 - With anchor". Within Chapter 4 and Chapter 6, the behaviour is worse as there are multiple ToC entries in each of these files. But, this is what happens in 4.12.12111. So, there is a change in behaviour with 4.13.12638. It affects a particular style of building the ToC. I haven't seen it as I strip out unnecessary anchors if I see them. But, a lot of my books don't have them at all. And I just wanna say thank you for all the other information you provided. Bravo. That has an option to set the language separately. This option is on the "Extended" tab of the options. That might be what is triggering the problem on the device. Yes, that is the option I was referring to.